My regular readers will know my argument that the stock market is highly over-valued and that stock market performance is all about, and only about, loose central bank policy. The Fed has stopped money creation via QE and has started to raise interest rates. I have therefore been expecting the market to figure out that the reason for higher stock prices is leaving the building, leading to a serious stock market correction. Today we got new highs instead which makes me wrong at the moment. But my thinking has not changed. Central bank policy is still driving the bus and it is not going to work for much longer. The new development that got in my way is the election of Trump which has acted as an aphrodisiac for the market; suddenly everything is going to be great, the economy is going to grow much faster and stocks will go higher still. That’s not going to happen, in my view, because central bank policy is tightening and that isn’t good for stocks no matter what Trump does. The chart below explains what I mean. The blue vertical bars represent the amount of “thin air’ money being created by the Fed (they control the Monetary Base of currency in circulation and bank cash reserves) and the commercial banks (they create money whenever they make a loan). The blue bars tell us how much money is being created out of thin air. As you can see, the rate of money creation has been falling over the past year, reflecting the end of Fed QE and softer commercial bank lending. The red line is the level of spending in the economy (advanced by one quarter because historically changes in spending come shortly after changes in money creation). As you can see, these factors co-relate very well. 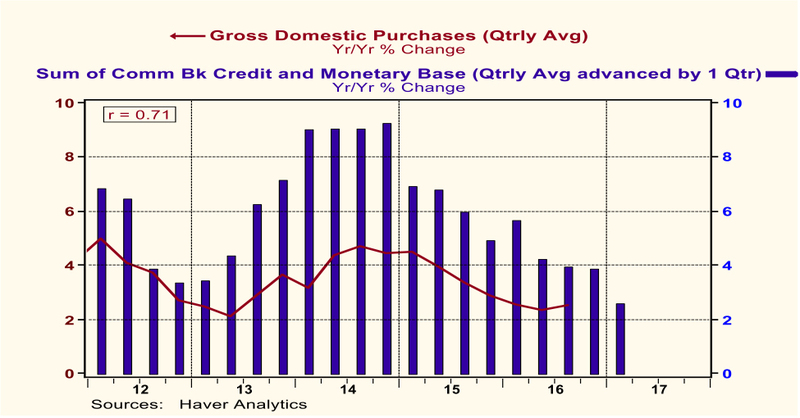 So, as the money creation slows down, so does the economy and that means the first quarter of this year is likely to be poor no matter what President Trump does. Here is a chart of the U.S. 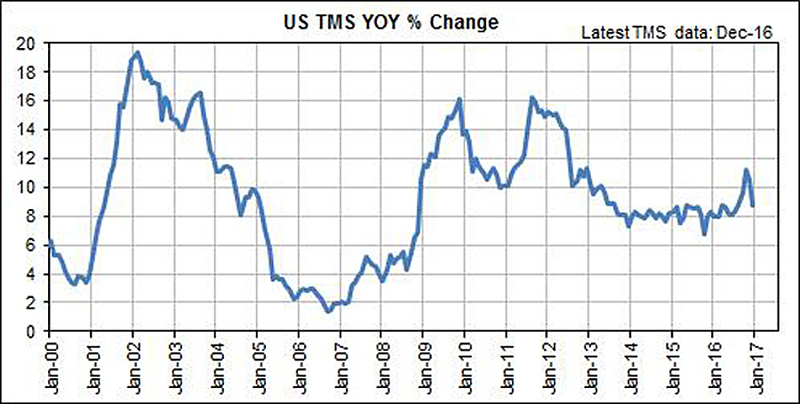 Adjusted Monetary Base which has been declining since the end of QE. Note the big bump higher starting in 2008 which quickly led to higher share prices…no coincidence. And here is the chart of the True Money Supply (essentially M2 without Money Market Funds which are not real money but rather a security that can be sold for cash). Once again, the trend has turned down. Follow the money, dear reader. Without it, the stock market cannot go higher for long.